The BJP is clearly nervous as eight constituencies in western UP, Saharanpur, Kairana, Muzaffarnagar, Bijnor, Meerut, Baghpat, Ghaziabad and Gautam Budh Nagar go to the polls Thursday. There is a lot riding on the outcome. Three Central ministers, General V K Singh, Mahesh Sharma and Satyapal Singh, and one former minister, Sanjeev Balyan, are fighting to retain their seats. Farmer leader Chaudhary Charan Singh’s son Ajit Singh and his grandson Jayant Chaudhary are battling equally fiercely to keep alive the legacy of the family’s leadership of the Jats. In 2014, the BJP’s most spectacular margins of victory in UP were in the west partly because of sharp polarisation in the wake of communal violence in Muzaffarnagar in 2013. Six of the eight seats are in the sugar cane belt with a high proportion of Jats and Muslims. But this time there is no Modi wave, even though one finds the Prime Minister generally gets good approval ratings. But it remains a tough act for the BJP to outnumber the formidable caste arithmetic working against it. In 2014, Gujjar leader Hukum Singh won the seat by 50.5 per cent of the vote. But in 2018 in a by-poll, when major Opposition parties banded together, his daughter Mriganka Singh lost to RLD’s Tabassum Hasan who polled 51.26 per cent of the vote, the former 46.5 per cent. Hasan had the solid backing of three big chunks of voters, Dalits, Muslims and Jats. While the BJP’s vote share declined only marginally, the Opposition unity factor had changed the whole equation. The Prime Minister has addressed two rallies in the region at Meerut and Saharanpur. Chief Minister Yogi Adityanath has held six rallies. Ajit Singh points out, “The fact that Modi singled out me and my son for a personal attack in his two meetings indicates he is agitated.’’ The BJP realizes that Jats will hold the key in deciding political fortunes in much of the sugar cane belt this time. It miscalculated in assuming that because Ajit was pushed to a humiliating third place in the 2014 Lok Sabha constituency in Charan Singh’s home town Baghpat, he was a spent force. “Charan Singh used to have 84 MLAs in the UP Assembly, his son frittered away his legacy and in the last Assembly election his party won not a single seat,’’ points out Sanjay Chillar, a Jat from Baghpat whose entire village Malmajra has turned to the BJP. But political fortunes can change overnight. A drive through Baghpat, where the articulate and down-to-earth 40-year-old Jayant is contesting and nearby Muzaffarnagar, where Ajit is contesting, suggests that both father and son may have an edge. Ajit Singh brushes aside being referred to as a “dal badloo’’ , pointing out that he has switched sides no more than most UP politicians. The RLD will clearly benefit from the solid phalanx of Muslim and Jatav voters supporting the gathbandhan which together with the Jats make for a winning formula, even if nearly all upper caste Hindus, as well as most smaller communities in the OBC category and some Gujjars vote for Modi. The irony is that while the RLD is a major beneficiary of the gathbandhan, the Jats are in fact the weakest link of the alliance. As one travels through the countryside and small towns, one finds plenty of Jats opting for Modi. Especially among the younger generation. Interestingly, the talking points in Delhi and on TV channels seem to have little resonance here. Modi’s development schemes from building toilets to free housing, electricity, gas connections and constructing highways are appreciated but are not usually a deciding factor. Nor is GST, demonetisation and the Rafale deal. In Ghaziabad, many committed loyalists insisted they would vote for Congress candidate Dolly Sharma with whom Priyanka Gandhi did a road show, few had even heard of the gathbandhan candidate, Suresh Bansal. In Saharanpur, the Congress’s Imran Masood, the nephew of six-time MP Rasheed Masood, is a popular local figure who in 2014 polled a phenomenal 34 per cent votes against the BJP’s 39.5 per cent. He will cut into the BSP candidate Hazi Fazlur Rehman’s votes unless one of them withdraws. 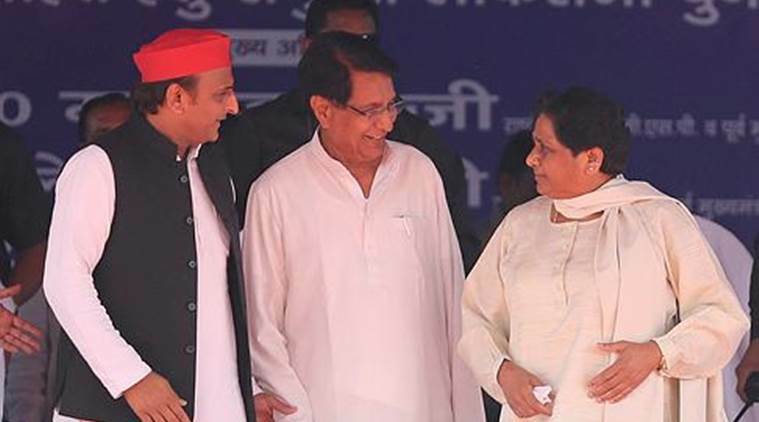 In fact, Mayawati’s outburst against the Congress at the rally in Deoband on Sunday and her appeal for Muslims to vote unitedly was directed largely at Imran though she is also annoyed that in Bijnor her one-time lieutenant Naseemuddin Siddique is contesting on a Congress ticket. On Sunday, the first joint rally of the BSP and SP in 25 years was an impressive show and even larger than Modi’s Sahranpur rally a day earlier. The two largely urbanized constituencies of Ghaziabad and Gautam Budh Nagar, which are part of the National Capital Region, have a totally different profile from the remaining six. This will benefit General V K Singh and Mahesh Sharma, the respective candidates from here. Though in Gautam Budh Nagar, which is popularly known as NOIDA, there is a large population of Gujjars in villages and also in Greater NOIDA who are likely to vote for Gujjar candidate Satibir Nagar of the BSP.